Sometimes scanning an interval with time-slices just doesn’t cut it. Learn how to create iso-proportional horizons through a reservoir interval and extract any attribute you need! This example is from the Monodon Basin in NW Australia. 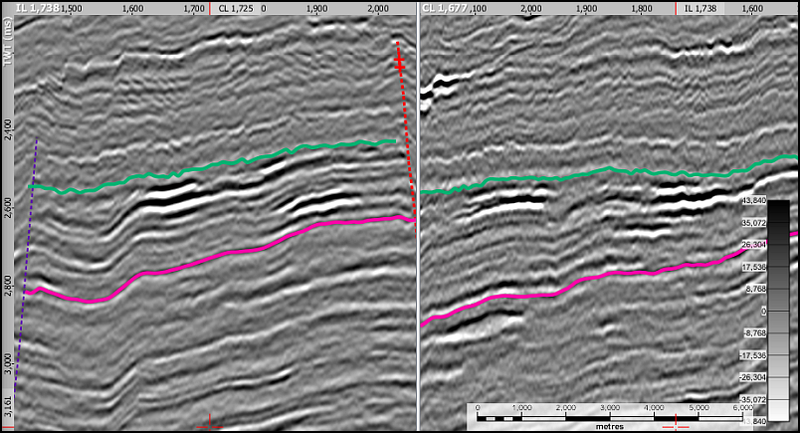 We have a clear structural trap bounded by faults to the East and West, overlaid by a thick Tertiary shale package. A top and base horizon has been picked for the reservoir with some bright amplitude events showing. From background geology and visible bright spots it’s likely there are channels within this interval and we want to identify them. By proportionally flattening the interval we can visualise amplitudes along flattened slices. This is great for viewing amplitudes but not so useful for windowed attributes such as RMS. We can tackle this by creating a set of proportional horizons based on the bounding horizons. Start by creating a new Flattener process in the Process Tab. Name the process, click OK.
Click the blue "+" button to add layers. Add Top and Base horizons. In IL/CL View, switch the domain to the newly created flattened domain. Tip: For the speed freaks out there, you can right click on the base horizon and select Flatten BaseRes. A flattener process will be created with the domain automatically switched to Flat: BaseRes. Jump over to the control panel to add the top horizon and set the conformability. This reconstructs the depositional environment by flattening the section to the top and base horizon. The data is proportionally stretched and squeezed over the interval. 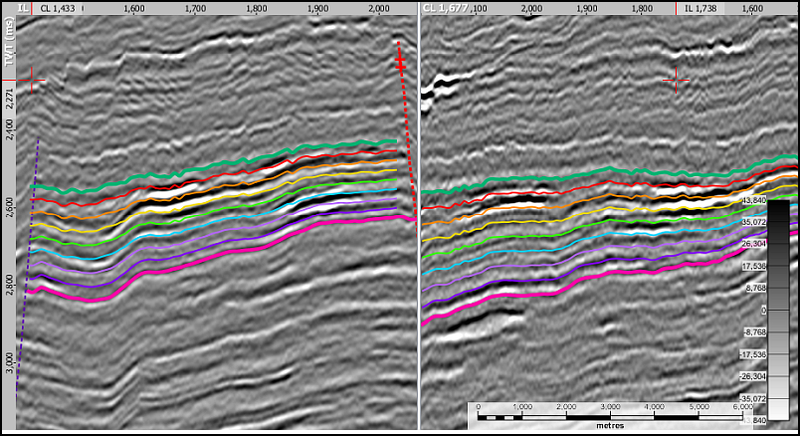 We can now view stratigraphic slices through the data, but to extract attributes we need a series of horizons. In the Map View, choose the Operations tab. Choose the operation Horizon Maths. Add the top and base horizons as horizon inputs (h1, h2). This creates a proportional horizon a quarter of the distance from the top to the base horizon. Click Calculate and save the result. Repeat this twice more using: (h2-h1) * 0.50 + h1 and (h2-h1) * 0.75 + h1. We can build as many horizons as necessary using this formula. This is the unflattened data. This is the flattened data. 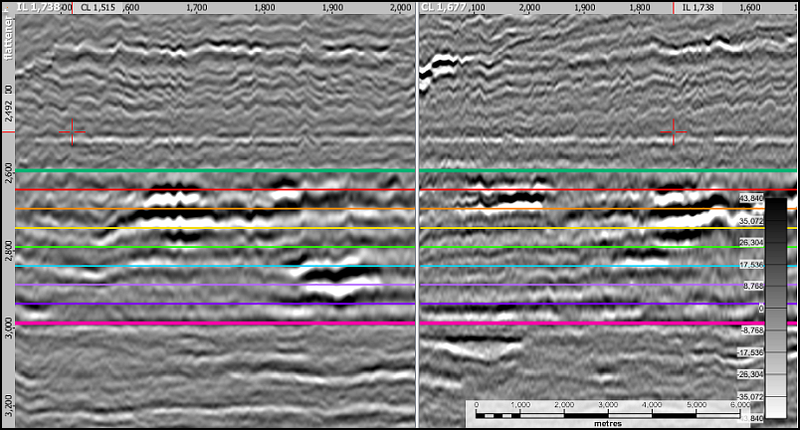 Our seismic data is proportionally stretched between the top and base horizon interval. With these proportional horizons we can look at more than just amplitude extractions - we can easily evaluate interval properties around the proportional horizons, or between the proportional layers. This is perfect for investigating RMS and Peak or Trough amplitudes. See our video on Amplitude Extraction & Horizon Attributes for more details on how to extract amplitudes to a horizon. Also, check out the online manual for details on amplitude extraction and calculating attributes between horizons. RMS extractions at 0 above to 20 below at horizons progressively deep in the interval. Notice the channel networks popping out.